Lenovo’s new Yoga Book draws the eye like no other tablet or laptop available today. People aren’t always sure what I’m reading my comics and or jotting down notes on, but they know it’s fascinating, and tiny, and cool. With its capacitive touch keyboard that turns into a drawing tablet with the press of the button, the Yoga Book is absolutely the future of laptops and tablets and the blurred space in between. But Lenovo’s thinnest laptop ever also has one major problem in that it only comes in a Windows and an Android flavor. Neither OS is ready for the future Lenovo’s built. Lenovo’s Yoga hinge continues to be one of the best 360-degree hinges. Because Windows 10 doesn’t work as well with low-voltage processors like the Intel Atom, that version will have worse battery life than the version I tested, and it’ll be less “snappy” than the Android variant. That said it will have a better range of apps, like the full versions of Photoshop and Microsoft Office. Meanwhile, Android is perfect for the Atom. I went almost twelve hours of regular use over the course of three days. But Android’s not exactly perfect for a laptop. Lenovo tries to bill the Yoga Book as a tablet, but I have a hard time calling it that just because it uses an Atom processor and an Android variant. Design-wise, the device’s lovely 360-degree watchband-like hinge resembles Lenovo’s Yoga-series laptops. 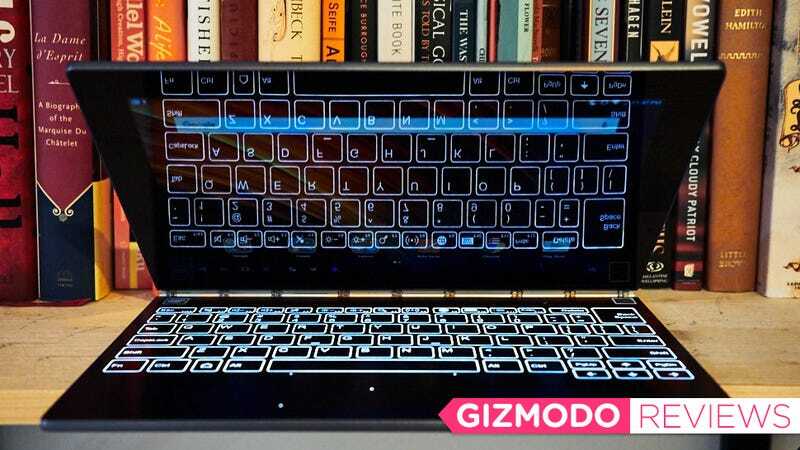 So like its bigger, decidedly laptop, cousins, the Yoga Book can be used like a laptop, or spun around into a tent mode for watching movies, or spun all the way back into a tablet configuration. In regular use, I found myself using the Yoga Book as a tablet most of the time. Did Lenovo know I would prefer tablet mode? Is that why it calls this a tablet? It can’t have, because Lenovo is banking on people loving the major defining difference between the new Book and the old Yoga series: The “Halo” keyboard. The bottom half of the device is a capacitive touch device. Press a button and the keyboard lights up. Press it again the keyboard disappears and it becomes the approximation of a Wacom graphic tablet—a cool feature in concept but less cool in practice when I used it on Android. Though it has the same 2048 levels of sensitivity as a high-end Wacom tablet, like the $225 Intuos Pro, Android lacks all the great apps of a Windows device, and thus you can’t really take full advantage of that utility. That said, it’s still very neat to show off to friends, and when you turn the keyboard on, and it lights up like something out of Star Trek, there’s a definite visceral I am touching the future feeling. Unfortunately, the Halo keyboard has a terrible layout. Even something as simple as hopping into Slack (or whatever inter-office messaging system you’re on) had me raging with frustration. In large measure, the keyboard is frustrating because despite Lenovo’s thoughtful engineering, it still doesn’t feel right. The Halo keyboard has moderate haptic feedback, but not enough to mimic typing on a real clickity-clackity keys. The feedback also has a minor delay, which leads to additional errors. I find myself frantically typing the same letter again and again waiting for that quick buzz against my fingertip. I art bad. Then I accidentally deleted some of the art. Which means I art even worse. Everything from layout to feedback can be fixed with a refresh—it’s badly needed. The other major issue with the keyboard, needs an engineering overhaul. The keyboard and trackpad work reasonably well on the Windows variant, but on Android, it becomes clear that the OS just isn’t ready for laptops. Working in Android on a laptop-like setup is as infuriating as it was last year with the mostly excellent Pixel C.
Android now allows you to have multiple apps open and running on the display at the same time, but it shrinks the apps into their smartphone versions, which means you often have to lean towards the screen and squint to read content. Android also isn’t good about switching between landscape and portrait mode on a lot of apps. I frequently found apps stretched and buggy until I returned them to portrait mode. There’s also few keyboard shortcuts on Android, so the quick efficiency of Windows, Mac, and even iOS, just isn’t there. Keys are spaced just differently enough for a lot of mistypes. Consequently the Yoga Book feels less like a cool tiny laptop (or productivity tablet) and more like a funky distraction gadget. What the Yoga Book really needs is an OS that works great in laptop and tablet scenarios (like Windows 10) and is light enough not to be slow when running on an Atom processor (like Android). Chrome OS, with its new ability to run Android apps, could be a nice choice, but it’s not that most touch-friendly of operating system. The bottom half of the computer is nearly as reflective as the top. The real solution doesn’t exist yet, but Google is rumored to be working on it. Codenamed “Andromeda” the new operation system will supposedly be a unique and better blend of Android and Chrome OS. It will have all of Chrome’s laptop wonder and all of Android’s apps and touch-based capabilities, and it won’t be a resource hog. Unfortunately it won’t be available until 2017 at the earliest and there is zero documentation on what kind of device it will even run on. But it would be perfect for the Yoga Book. This ultra thin device feels like the future of mobile computing, and it’s so close to being good that it’s maddening when it’s bad. With some tweaks to the keyboard and an operating system that doesn’t even exist yet the Yoga Book could be the laptop tablet hybrid you didn’t even know you wanted. But right now this feels more like a cool party trick. If you want to wow your friends with a new device than drop your $500, but don’t expect to get any work done. Then pen is included, as are real pen inserts. Yes you will accidentally draw all over the keyboard at least once. Available in a Windows flavor starting at $550 and an Android flavor starting at $500.